Spring is a time when the world awakens from its wintry slumber, when nature blossoms, days lengthen, temperatures rise and we feel ready to get back out into the world. Being mindful of this season, with all its accompanying wonders, allows us to appreciate it, savour it and experience more calm and contentment during Spring and as we move into Summer. Savour the Season: Step into Spring with Mindful Intention Ebook is a guide to fully participating in Spring, to making the most of all the season has to offer and to being intentional about how we want to move through Spring and into the Summer. Woven into the Ebook are resources including worksheets, audio guides, suggested books and websites, along with thought-provoking questions and creative prompts. During Winter it can feel like the long nights, the overcast days, the cold, the rain and the snow will never end… and yet, eventually Winter does give way to Spring. This longed-for season can be a great source of hope, inspiration and joy, if we open our eyes to it. Savouring Spring – paying attention to how the world around us is blossoming, even when the weather doesn't co-operate – gives us the opportunity to spend less time in our heads overthinking and instead to really embrace the season and create calm and joy in every day. 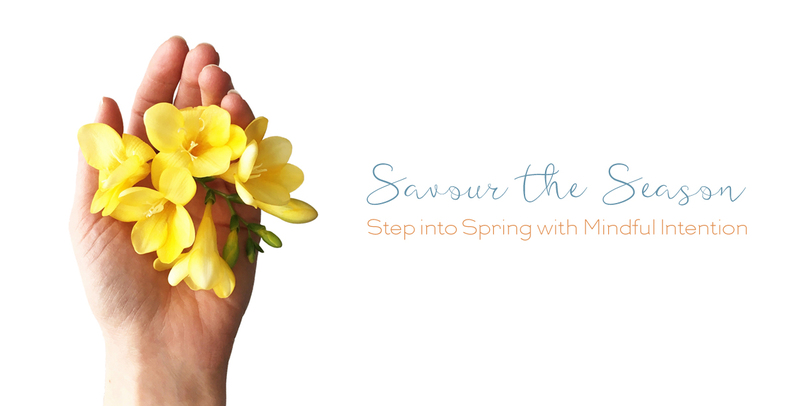 With Savour the Season: Step into Spring with Mindful Intention Ebook you will experience all that Spring has to offer with more mindfulness, appreciation, calm, creativity, fun and clarity on how you want to feel and what you want do during this season and on into the next. After your purchase you will have access to your Savour the Season: Step into Spring with Mindful Intention Ebook so you can begin savouring the season without delay.